For some reason, whenever I drive through Napoleon, Ohio, a heavy rain seems to be falling. I've admired the courthouse in the center of town, but the rain wouldn't cooperate by letting up long enough for me to stop and take a few photos of the beautiful 1880s building. The afternoon we last drove through town was no different, but I was determined to finally get at least a few images of the Henry County Courthouse in downtown Napoleon. I keep a two-gallon plastic zipper-close bag in my camera bag, so I had something to keep my camera dry with me during our most recent pass through Napoleon as we returned home from a visit to Sauder Village. I got soaked, but I got a few images and my camera stayed dry! Napoleon is about 40 miles southwest of Toledo in northwestern Ohio and is a namesake for Revolutionary-era patriot Patrick Henry, the orator best known for the phrase "give me liberty or give me death". The area drew many new settlers during the 1820s and 1830s with the clearing of the Great Black Swamp and construction of Ohio's network of canals. Henry County's first courthouse was a log cabin built in 1832, but court began meeting in a nearby tavern's dining room by 1834. The second courthouse was a two-story cabin erected near the current courthouse site in 1844 by Michael Shurman for $2,000. 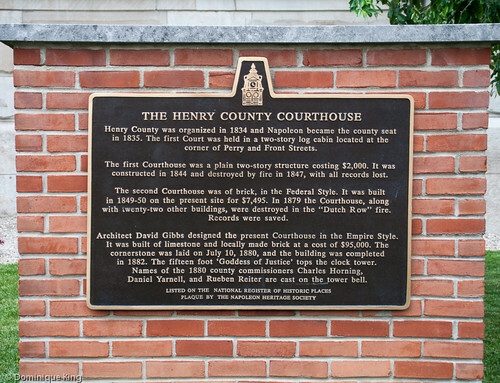 A fire destroyed the building and all court records in 1847. County officials approved the building of a brick, Federal-style courthouse in 1849 and saw it completed at a cost of $7,495 in 1850. The building had an impressive entrance with white pillars and a bell tower. Fire again struck Napoleon in 1879 and almost leveled the town, destroying over 20 buildings that included the brick courthouse. The county engaged architect David W. Gibbs of Toledo to design a new courthouse and laid a cornerstone for the project in 1880. Gibbs presented plans for a four-story building with four square corner towers capped with finials. A 15-foot-tall statue of Lady Justice stood atop a central clock tower. The Second Empire-style courthouse, made with limestone and locally made brick, also featured mansard roofs and cost $95,000. 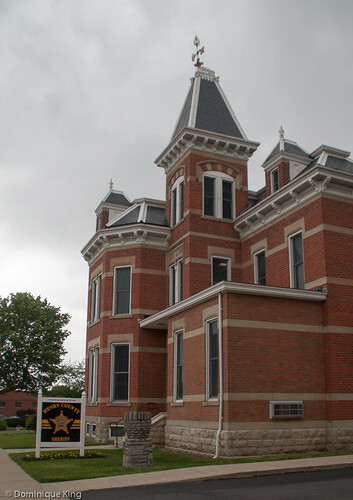 The courthouse and a two-and-a-half story jail and sheriff's residence around the corner, done in a similar architectural style for $20,000, opened for business in 1882. The county courthouse earned a spot on the National Register of Historic Places in 1973. The County Sheriff's Residence and Jail got on the register in 1981. 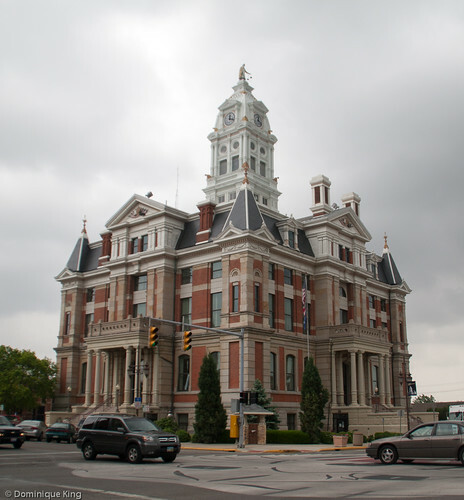 In the 1990s, county voters agreed to fund repairs and restoration of the courthouse with a four-million-dollar bond issue. 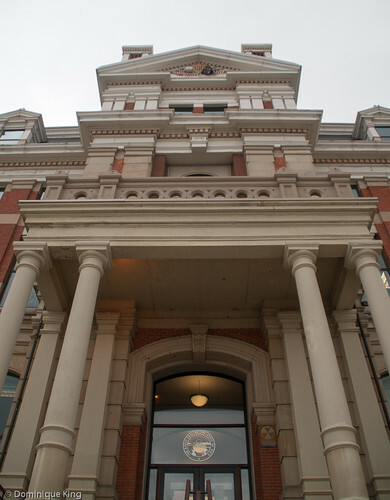 The 1998 restoration and renovation also included modernizing the courthouse by adding air conditioning and new computer equipment. I took as many photos as I could of the courthouse complex during our last visit by briefly pulling my camera out of its protective two-gallon plastic bag, tucking it back into the bag and running to a different vantage point and repeating that process several times. As much as my brief glimpses of the Henry County Courthouse fueled my desire to return to take photos during better weather and at a more leisurely pace, what I later learned about architect David Gibbs and his career makes me even more excited to see more of his work. Civil War veteran Gibbs designed a number of courthouses in Ohio. His Union County Courthouse, just north west of the city of Columbus, is a near twin to the Henry County Courthouse. Other Gibbs-designed Ohio courthouses with plans strikingly similar to the Henry and Union County courthouses include courthouses for the counties of Marion, Butler and Fayette. Gibbs also drew up the design and specs for the Wyoming State Capitol building in 1886. 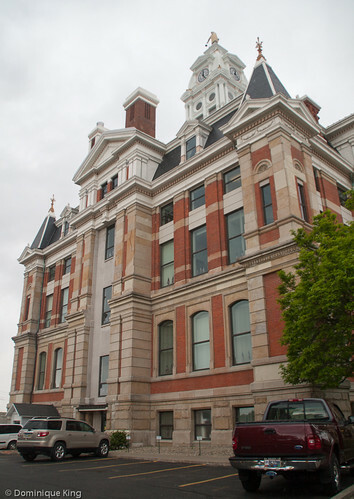 That building in downtown Cheyenne has some similarities to Gibbs' Ohio courthouse designs. Wyoming's capitol building, completed in 1890, earned its spot on the National Register of Historic Places in 1987. I next traced Gibbs to Oklahoma City where he operated an ice cream parlor. He and his family were very active in the city's civic life. His wife served as president of the Ladies' Relief Club raising money for the needy, and his daughter often entertained townspeople by playing the city's first piano in her father's ice cream store. Gibbs served as chairman of a board of trustees who helped set up the Oklahoma City statutory government in 1890 and became one of the city's first real mayors for a short time. Gibbs returned to Toledo, Ohio after his wife's death in 1912 to live with his daughter. He died there in 1917, and his grave is at Toledo's historic Woodlawn Cemetery. 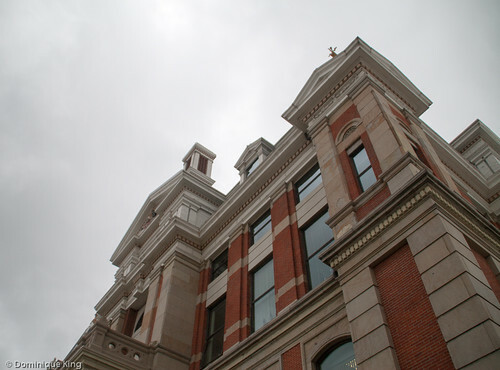 Want to learn more about Ohio's historic county courthouses? Check out County Courthouses of Ohio by Susan W. Thrane. Your local hardware or grocery store doesn't carry the 2-gallon plastic bags? I found them on Amazon.